Philippe said that the next planned rise in the so-called carbon tax on vehicle fuel, which had been due to come in on 1 January, would be suspended for six months to allow consultations across the country to see what accompanying measures might be introduced to ease the burden for the worst-off. "This anger, you would have to be deaf and blind not to see it, nor hear it," said Philippe after meeting lawmakers from the governing party La Republique en Marche. 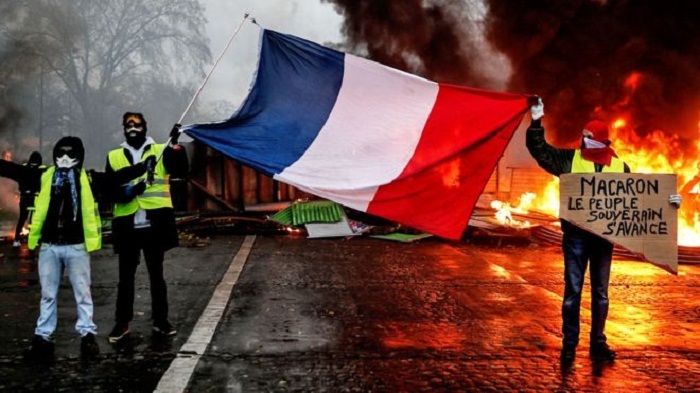 "The French who have donned yellow vests want taxes to drop, and work to pay. That's also what we want. If I didn't manage to explain it, if the ruling majority didn't manage to convince the French, then something must change," he added in his televised address. "No tax merits putting the unity of the nation in danger." But he said the violence must stop. "If there is another day of protests, it must be declared in advance and must take place calmly." Macron was elected on a platform of economic reform which would improve the lives of French people via lower unemployment and a kick-started economy. There are plenty of voices that can be heard today saying they want more. Why is it only a suspension of the tax rise, they ask, and not an abolition? What is to guarantee that the government won't reinstate it next June? Maybe we need to step up the pressure. But by making a concession, the government does not need to satisfy everyone. It needs only to satisfy a large enough bloc of "moderates" among the gilets jaunes, and wean them away from the barricades. If that happens, then the movement will lose momentum. And though it won't be over, the end will be in sight. My bet would be that this will be what happens. Opinion polls will show a general approval of the government's concession. The gilets jaunes en masse start to waver. But there's still a protest by hardliners on Saturday. Maybe a parting shot, but still - and maybe because of that - a dangerous moment. Yellow vest spokesman Benjamin Cauchy said the movement wanted a cancellation - not a postponement - of the taxes. "The measures announced today do not satisfy us at all, for the simple reason they don't go far enough," he told reporter Chris Bockman in Toulouse. "The French people want a complete political transformation. They want to change the way things have been for the last 30 years. "We're sick and tired of taxes being raised and the quality of public services going down. There are more and more people out there who can't make ends meet each month, more and more people are sleeping rough and yet we continue to raise taxes. "Where is the money going? Where is it being used?" Fears that violent protests in the capital could continue next weekend have led Paris St Germain to postpone their League 1 home football match on Saturday. Macron has blamed world oil prices for three-quarters of the price rise, but said higher taxes on fossil fuels were needed to fund renewable energy investments. Protesters say Macron is out of touch, particularly with non-city dwellers who rely on their cars.